From the “opposite to sporty” to competing in a triathlon – how does it happen? For Peter Lambert, the journey started with some light cycling to help with a knee injury. I was not one of the sporty kids at school. Pretty much the opposite of sporty. I played field hockey from the age 4, but my friends’ team was so good that as a defender I would fall asleep leaning on my stick. I was a decent natural swimmer, but never trained to be competitive. My only time of regularly running was during three months of Navy recruit school, and I developed shin splints from that effort. I discovered music at 8 years old. It was 22 years later that I re-entered sport, through ice hockey. An interest in cycling started in May 2016 as an attempt to recover from a knee injury, and though I was keen to return to hockey after experiencing improved strength and stability in my right knee, I held off on cycling events. My first mountain to climb was the 2016 MS Sydney to the Gong ride in November. There were literally mountains, well, maybe big hills, and I went all-in on the 90-kilometre event. After the “Gong” ride I told my cycling colleague that I needed a new challenge – he told me to sign up for the Sparke Helmore Triathlon in February 2017. “How ridiculous!” I said to myself. It’s not a challenge if it’s easy, and my experience in setting a high goal in doing the “Gong” ride taught me that I needed to question my own view of myself and my abilities. I was hoping there would be an over 40 year old, over 130kg division. Unfortunately not. 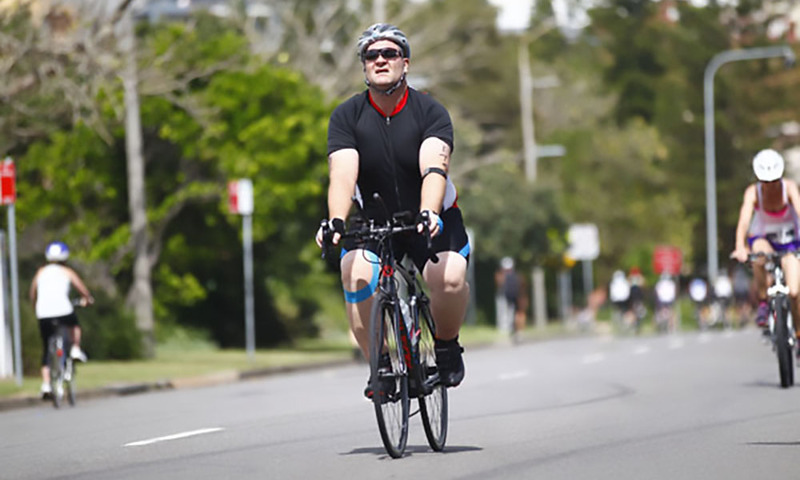 An Olympic distance would have been an outrageous and probably dangerous challenge, but they had the enticer event – 300m harbour swim, 15km ride and 3km run. The 3km run had me concerned. I signed up not long before Christmas and kept up the cycling. I took my first opportunities to run and swim while on holidays in Queensland. My wife Sam would just nod and smile, obviously in shock over this mental illness that had caused her long-time sedentary husband to believe he could compete in a race. My first run when I came home from Queensland was memorable. My beat-up walking/running shoes, a street party where I became the entertainment – a simple run around the block. I could pretend that guys laughing at me shuffling past the party where they chugged their VBs upset or offended me, or that the admonishment from one of their partners inspired me – neither was true, but it was a validation. “No matter how ugly it looks, I’m running, and you’re drinking awful beer” I convinced myself. Over the weeks I added more distance and difficulty to my runs, plus a loud pair of new running shoes, some Speedo-type swimming shorts triathletes call “Jammers” and two pair of swimming goggles to the arsenal. I had a long packing list I wanted to fill by race day. I became a regular watcher of YouTube videos about “My First Triathlon” and everything/anything I might need, trying to soak in enough wisdom and experience from others to get me through the event. I did and still do have trouble grasping that I was an athlete in a race. How can a heavyweight who’s never been useful at any sport compete in a race and call himself a triathlete, let alone an athlete? The experience of others blogging about their fears was helpful, though most were runners scared by the swim leg, not cyclists sweating the run leg. Blogger “Triathlete Taren” on YouTube provided heaps of great advice that really helped me through the preparation and the event. I’d like to acknowledge his work – you can find his content here. I was fairly comfortable swimming 1.5km in the pool by the time the Sparke Helmore came around, and I was running 4km on flat ground. I chose these distances expecting tougher conditions in my 300m harbour swim and 3km on flat ground in my run. I practiced my transitions in the February heat in my backyard, and I completed a ride, run, swim of the triathlon distance early one Friday morning, 16 days prior to my event. I’d expected to share the day with workmates doing the Olympic or sprint events prior to mine, but due to injuries or fading interest I was the only one going ahead on the day. I visited the site the day prior and picked up my kit. I surveyed the start and transition points and further refined my plan for the day, mostly by simplifying things. I was going in all alone, which took a little courage. At least I thought I was doing it alone. My race was the last event of the day, but I wanted to get in fairly early to get a good spot and watch the other races. I found myself a spot right down near the entrance on the back row, and alongside a black and orange bike. I laid out some of my gear and sent some messages to my wife Sam as she and my daughter Charlotte were coming along to cheer for me, along with a mutual friend and her two boys. Soon the owner of the black and orange bike arrived. It was Hayden, a friend from TAFE in 2014, also competing in his first triathlon. I knew he was back in Newcastle but the coincidence was just uncanny. Now I had someone to talk to and share the experience with. Sure, he’s 20 years younger and much fitter than I but in many ways we were in for the same experience. For us, this was a race against ourselves, but with no result we could compare with, other than finishing or not. There were plenty of other people I met around the event I knew – not too surprising with all of the links to local sports and business, and that’s life in Newcastle. Another person I knew doing the enticer was former hockey teammate and referee, Darren Hawkins. It turns out Darren’s pretty good at these triathlon events. I watched the sprint event start and the ferry arrive with my wife and daughter, then set about waiting for my event to start. The weather was clearing so I changed my gear a little to suit conditions. Waiting to jump into the harbour became a little weird. We were delayed around 20 minutes, and as spectators were amongst us at the wharf edge, I was trying to keep my 5 year old occupied while trying not to freak out about what was about to happen. Spectators also sat along the edge of the wharf for a great seat, unknowingly blocking our access when the call was made to jump in. Jump in I did, and although we’d had a crazy hot February, today wasn’t one of those days and the water was an expected cold shock. I knew it was going to be quite different to the pool swimming I had been doing – the first problem was the outgoing tide sucking us through the start gate while we waited to start. As our leg was a buoy and back swim, that meant we were going against the current on the way back in. I felt pretty well prepared for the swim leg, but once we were off I had no problem staying near the back/outside as others pulled away. I had to swim across my path quite a lot to correct for the pull of the current and as I rounded the bottom buoy I faced my first complication – I could feel that either my timing chip or the neoprene strap protecting my ankle from the timing chip strap was coming loose and flapping about in the water. It felt more like it was the neoprene strap so I stopped my light kicking and switched to arms-only for the uphill run back. Unexpectedly I faced complication number two – the women had been started just two minutes after us and my delay in trying to fix my ankle equipment had placed me in the washing machine that is the front of the swim pack, though not my swim pack. It was a traffic jam by the time I made it back to the exit scaffold, and then as I swam the last five metres, I felt the loose object on my ankle come free. It was my timing chip, and without it I was out of the event, just 10 minutes in. I rued three months of wasted preparation. I grabbed the scaffold but didn’t mount it, looking for my chip – hoping it didn’t sink. “Is this yours” said another of the guys getting out. I experienced a huge wave of relief as I took the chip back with thanks. I stuffed it into my mouth and climbed up the scaff, then re-strapped my timing chip. It stayed in place from that point on. Swim leg done and day saved. It was time to run/shuffle my way to my bike for my strong discipline, the ride. The ride was fun for me, and I felt like I was one of the quickest out there. I really felt it when I was done and had to run 3km immediately afterwards. On the bike leg though, I enjoyed seeing the huge variety of men and women having a go like me. It was inspiring and humbling. The run was tough, and I was distracted by my cycling jersey, which was long enough on a bike but kept lifting up to show my ample belly while upright and running. I can’t decide if the distraction hindered my focus or helped keep my mind off my soaring heart rate. In the end though, I did my fastest ever times over distance in that run. As I ran my last kilometre, the rain began to fall, and the heavens opened as a crossed the finish line. I crossed in 1:14:40, good for 22nd in the male 40-49 division, with 28 finishing the event. My wife and daughter were waiting for me at the finish line, cheering me on as they had throughout my swim and cycle legs. I didn’t get the euphoric rush that some participants talk about, but it was definitely a thrill to finish and not feel like an embarrassment. I notice entries are open now for 2018. Should I try to beat my enticer time, or take the leap into the sprint event? What’s certain is I’ll be back to go one better.